Pneumatic-Egg-Punch products are used to open embryonated chicken eggs conveniently. 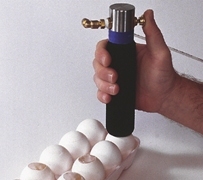 Compressed air (50 to 100 psi) is used for clean opening of the eggs. When the trigger button is pressed, the knife will create a clean and circular opening in embryonated chicken eggs allowing removal of egg shell easily. Pneumatic-Egg-Punch products are made up of stainless steel and fittings are designed using brass. The products are suitable for sterilization using disinfectants such as alcohol. 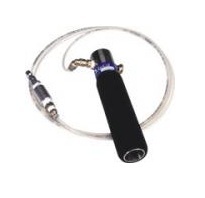 The products are available with a punching blade which is secured by disposable safety nuts. The product weighs about 1 kg and is available in handheld models with foam grip for ease of handling. Pneumatic-Egg-Punch products has varied egg opening capacity ranging from 60 punches per minute and are used widely for research in the field of molecular embryology. Once submitted, we will try and place you in contact with a suitable Pneumatic Egg Punch supplier within 48 hours.